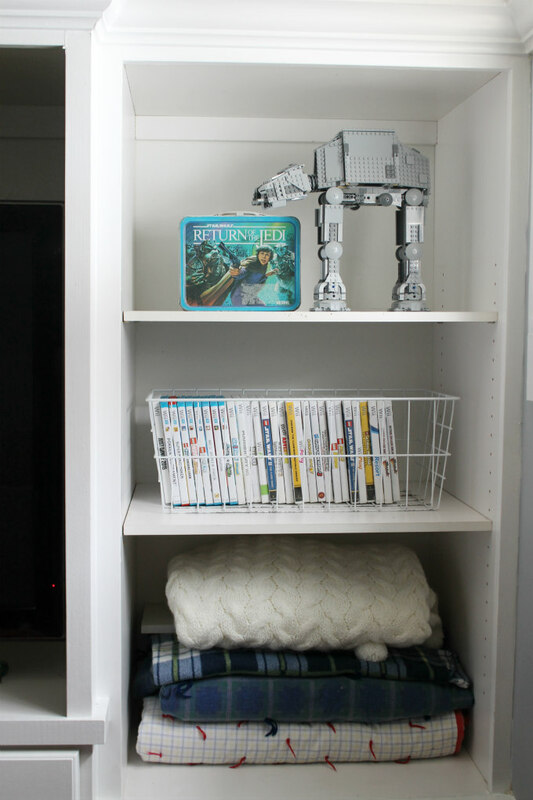 There is a room in our home that I have never ever shared here on the blog before, and that would be our basement! It seems weird that I've never shared this room before because it is the room that my family spends the most time in. 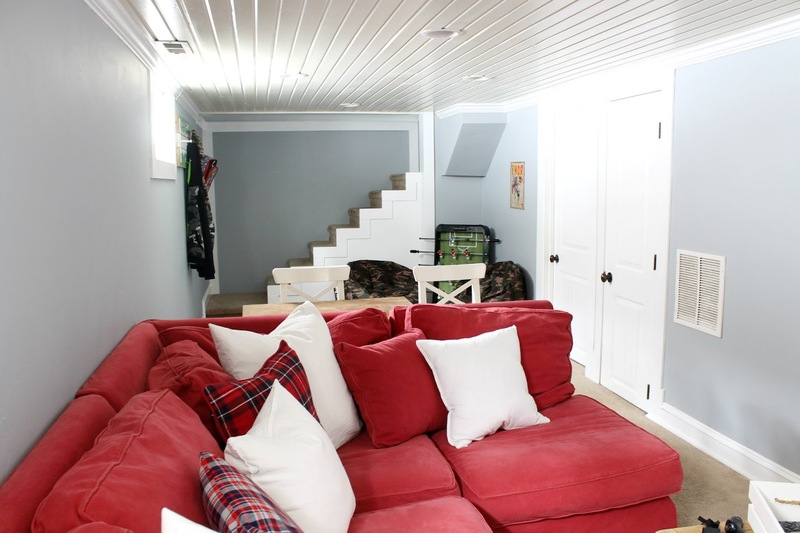 The reason why I haven't ever shared this room is because when we first moved into our home, I had an agreement with my husband and two boys that I could decorate the upstairs ANY way I wished, but the Basement, That was for the guys and I was not allowed to decorate it. Fair enough, right? Well let's just say it was looking pretty rundown, so I talked them into letting me give it a fresh new paint job and they agreed. 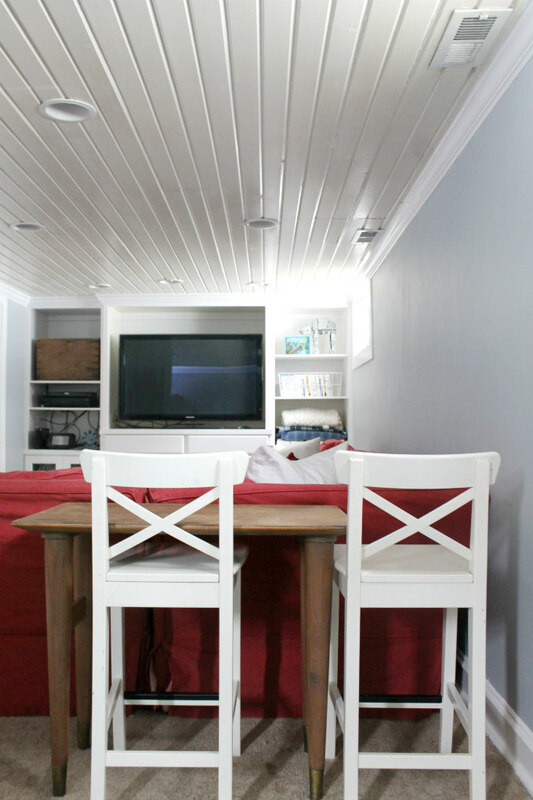 My husband help choose the new paint color and it now looks so much better and worthy of a blog post. / aka The family room / aka the t.v. room / aka the playroom / aka the movie room / aka the video game room / aka the all day Saturday room. Well, you get the idea, we use this room a lot. 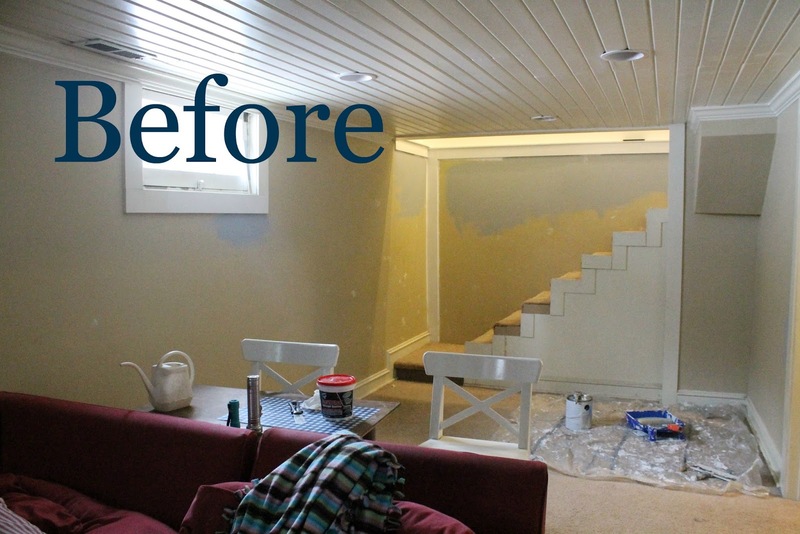 The basement was painted in a tan color before, which was fine but it was in need of some major freshening up. 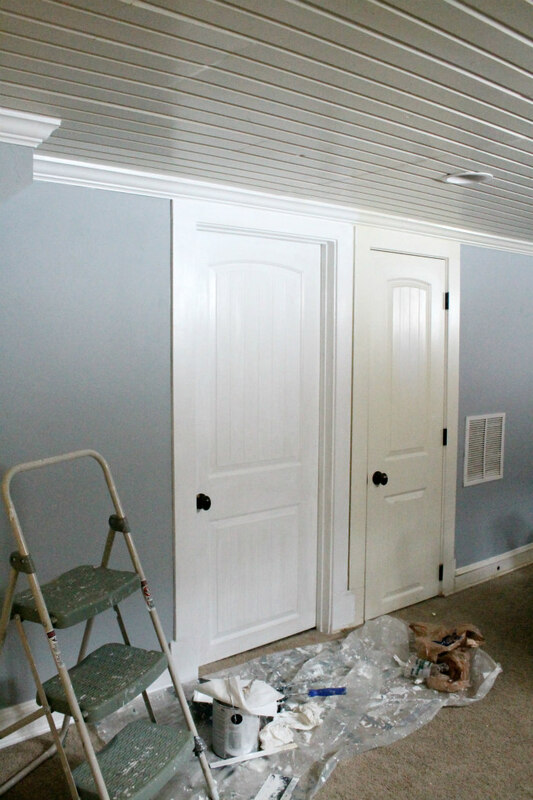 The walls got painted in a color called, StarGazer by Olympic paint, and then all of the doors and molding got painted in my favorite Olympic One (not tinted) paint. 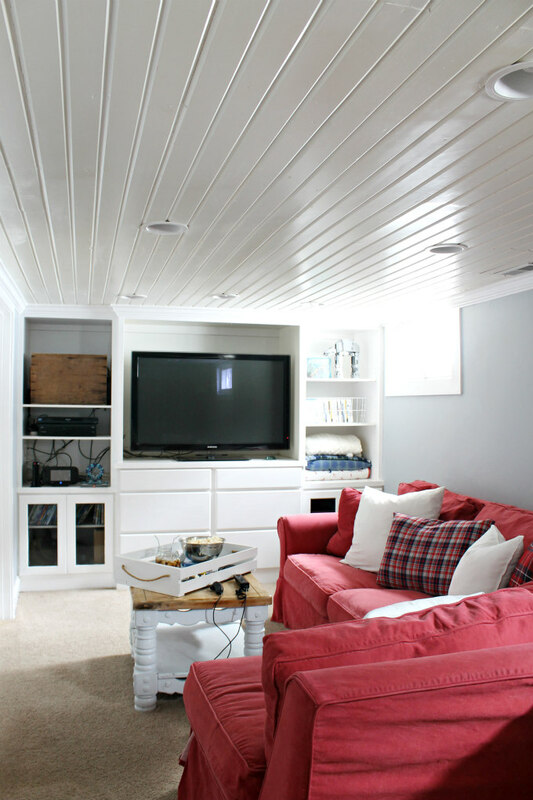 I love the look of freshly painted walls and bright white trim. I feel like I have a whole new basement now. 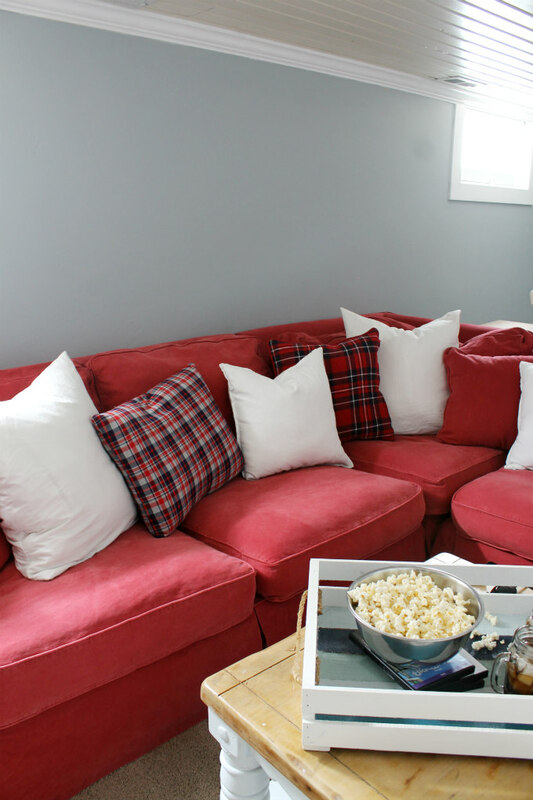 We've had this red sectional couch from Arhaus for years now, and we would actually love to replace it with some leather recliners. Actually, my husband would love to have two rows of reclining leather couches, where the back row would be on some sort of a platform. I even think that would be kinda cool. It would be like a mini theater and everyone would get a 'good seat'. 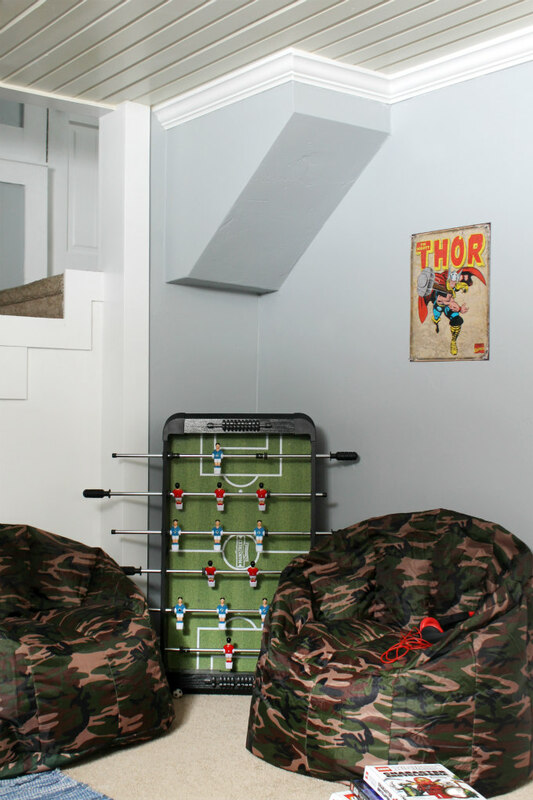 Across the room, I have created a little corner for my boys to hang out in. The camo beanbag chairs were from Walmart. This area has become their favorite after school spot. 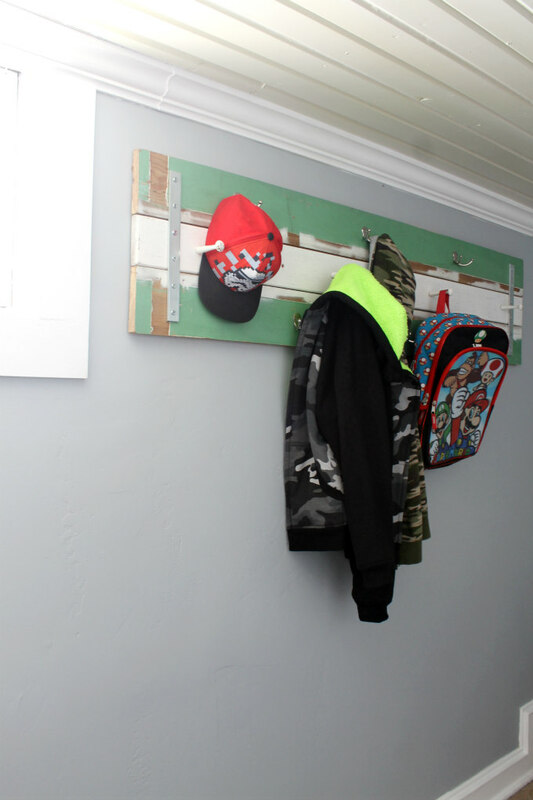 I made the coat rack with some salvaged wood and I think it turned out really cool. I'll be sharing more about it soon. My favorite thing about it, is that my boys come home from school now and immediately hang up their coats and backpacks, whereas before, they would just pile that stuff on the floor. 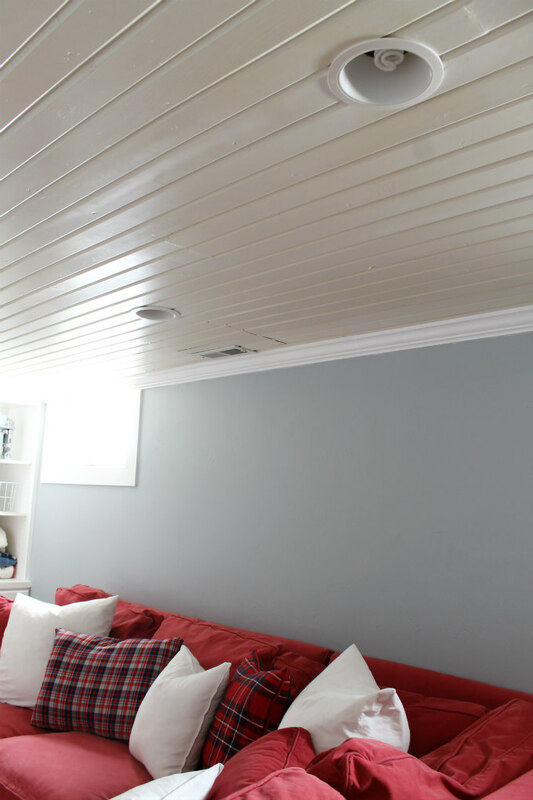 You may have noticed that I didn't paint the ceiling, I just kept it the cream color it was before. 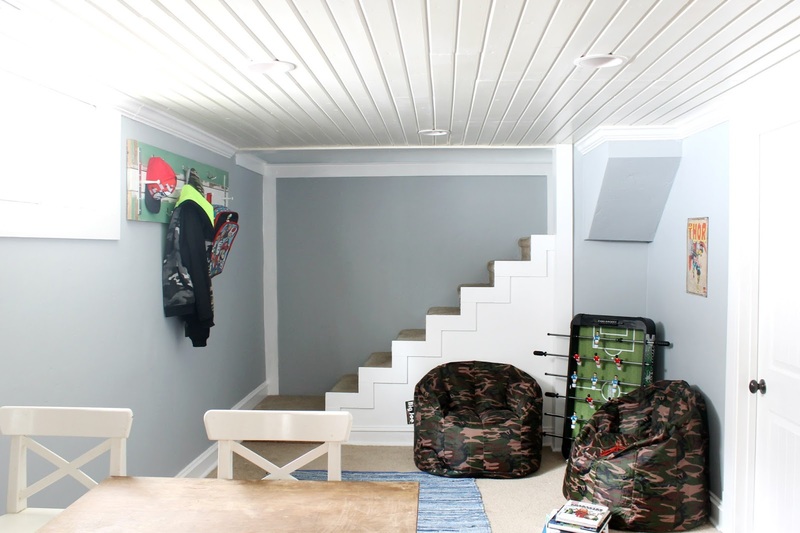 When I have painted the ceilings from cream to white in the rest of our home, I've noticed that they visually felt lower, and being that this is a basement, I didn't want that to happen here. 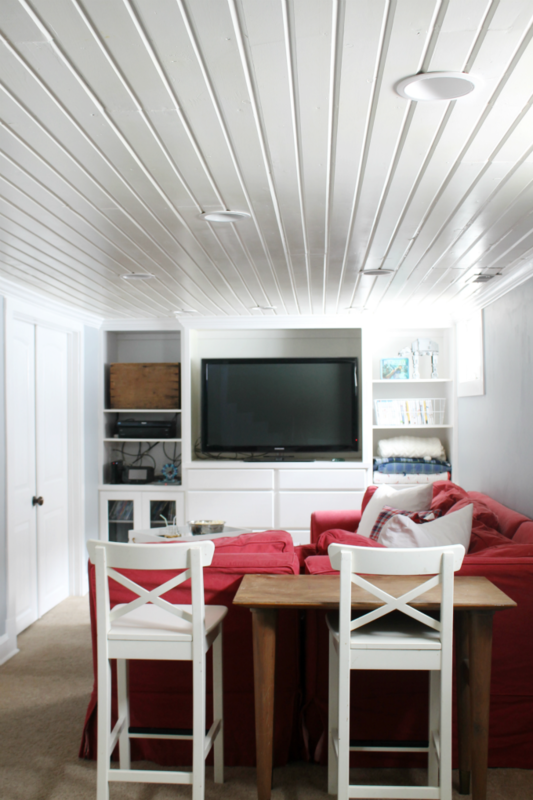 And by the way, aren't these plank ceilings awesome? I love them. I wish they were in the rest of our home. 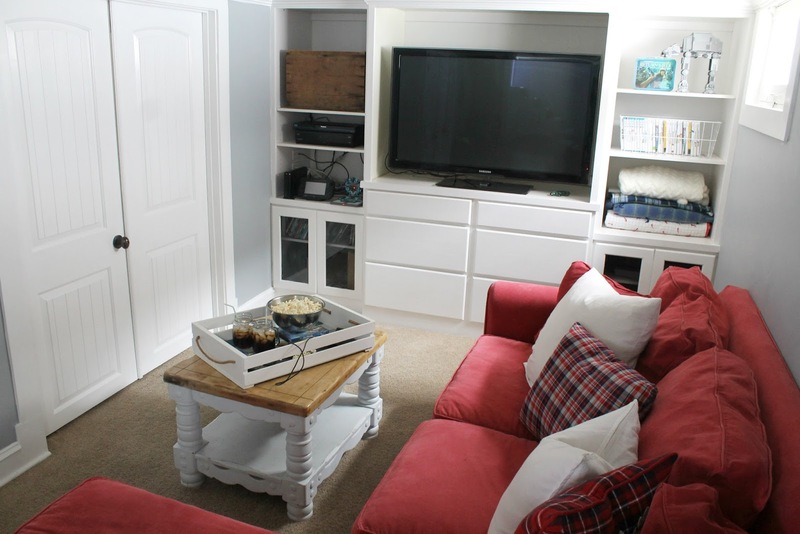 The built-in entertainment center is a nice feature to the room too. 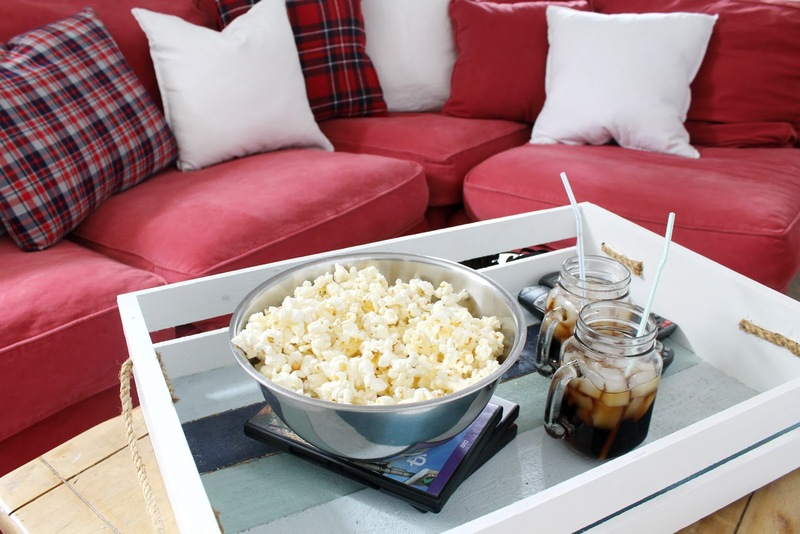 I like that it has a lot of hidden storage for our movies, cords, and what not. 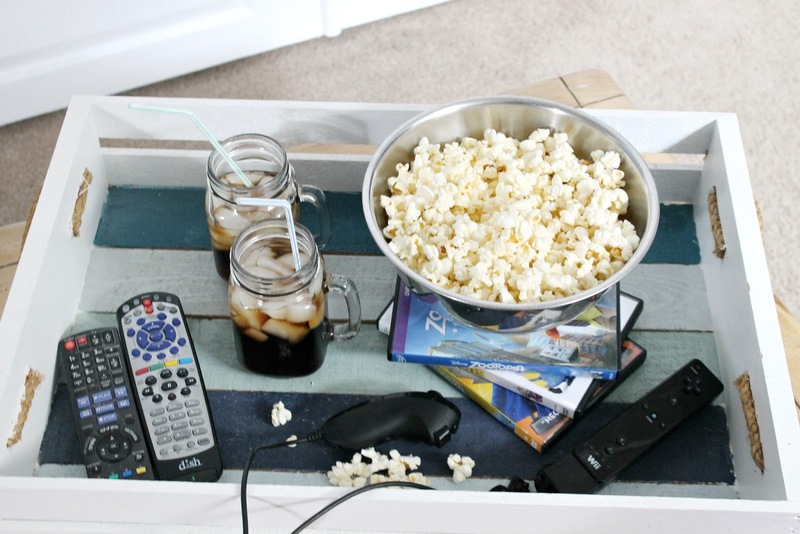 My beachy crate tray works great for a catch-all on the coffee table. My boys do a bit of snacking down here, So I have set up a table and bar stools behind the couch. As you can see though, the table isn't quite the right size, so I plan on buying or building something better. And behind those french doors is our Lego room. Everybody has a Lego room, right? Maybe one day I'll get my hands on that room to share with you. Our laundry room is down here too, and it could use a little makeover as well, but I'll save that for another day. What do you think of our newly-painted, clean-for-now basement? My boys are pleased with it and I no longer have to cringe every time I come down here, so its been great for us and that's all that matters. I love it! That is a really great space. Amazing what a fresh coat of paint can do for a room. I would love to have a room like this for us to watch tv and hang out. Thank you Robyn! It's been a great room for us. Thank you So much, Silvia! That was really kind of you to say and I needed to hear that today. Thank you for following me! Your basement is really cool!! 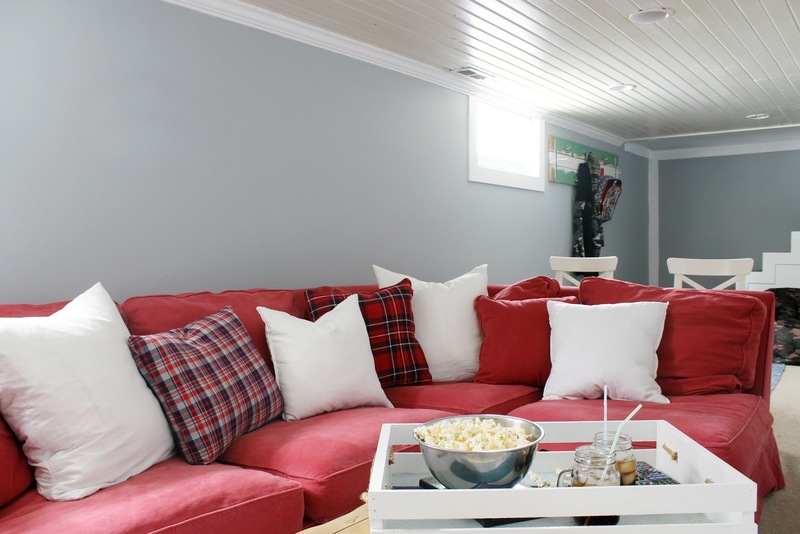 I'd love to have a space like this for my girls.... we don't have a basement or playroom or family room or TV room....it all happens in our living room right now... anyways, love those walls and how it's all set up!